When Kevin McCloud in his brilliant recent TV documentary ‘ Slumming It ‘showed how happiness in the world’s biggest slum Dharavi derives not so much from rampant individualism, but more from the mutual support and community spirit engendered through shared space and shared values. Similarly, when sociologists and anthropologists attribute our present sense of alienation to the lack of community spirit---a theory also propounded in books like Tom Hodgkinson’s How to be Idle, and How to be Free, which adopt a mainly Kropotkinite anarchist perspective--- there is clearly something in the air, a sense perhaps that we are in the West at last examining whether membership of an advanced consumer society is what we truly want. In the early years of the last century, galloping social and industrial changes prompted a similar debate. One of the most influential protagonists was the proto-socialist George Sturt (1863 – 1927),who from his base in Farnham, the former home of that other radical social commentator, William Cobbett, published Change in the Village (1912). Sturt, writing under his pseudonym George Bourne, surveyed Edwardian social and economic ‘progress’ from the perspective of a ruralist looking back to an era before the motor vehicle had ushered in a revolution in the social fabric of rural life. To him the 1880s he knew as a young man was a time when life had hardly changed for the rural labouring class for centuries, where the pleasures they shared remained untainted by industrial progress, and any problems and hardships were overcome, or at least mitigated, through community spirit and cooperation. But Sturt was no sentimentalist, and though he regrets the loss of what he calls ‘ the scene of a joyful and comely art of living ‘ he ( as a good Fabian ) ‘ would not go back ‘. Thanks Robin wise and timely words. I shall keep an eye out for these three. 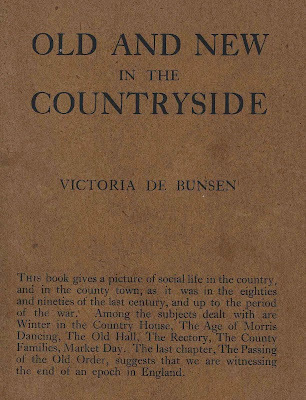 I note that Victoria de Bunsen came from a grand but radical family -- she was the sister of philanthropist Charles Roden Buxton who lived such a frugal lifestyle that, on walking tours in the south of England, he was sometimes mistaken for a tramp. This often happens to bookdealers down on their luck. When this recession finishes (if it ever does) I trust that the renewed interest in community, altruism and less materialistic ways of living does not end with it. Let’s hope we don’t return to an era of total bastards in red braces swigging Bollinger and charging round in Aston Martins. Good to hear the sacred name Major Gambier Parry—I have a feeling I have a few on the net that could be repriced!